Take a 1965 Ford Mustang, Add a Roush Yates 410 cubic inch Ford V8. Add a six-speed transmission. Add all-wheel drive. Add paint and bodywork that make it downright terrifying to look at. 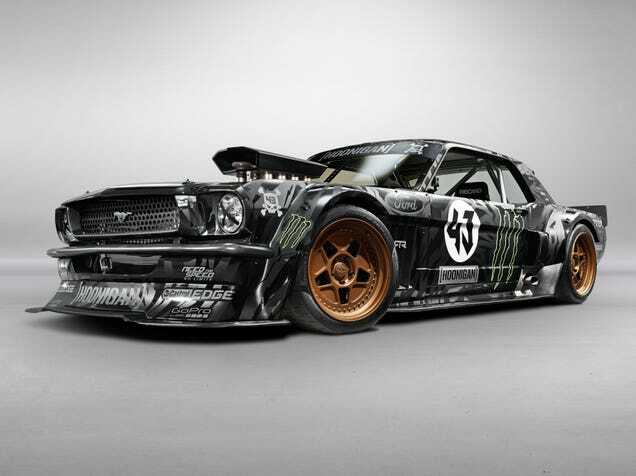 You get The Hoonicorn, Ken Block’s ride of choice for the seventh installation of his Gymkhana insanity-fest. We kind of knew this was coming last month when it was spotted doing four-wheel donuts in Los Angeles. Now we know the car’s full specs, and it’s an absolute terrorbeast of a car. It took two years to build The Hoonicorn at ASD Motorsports in Charlotte, North Carolina. The design is inspired by everything from classic American muscle to DTM racers to WRC rally cars to the toy cars Block had as a kid. Built with the aid of RTR, it puts ferocious power to the ground via a one-off Sadev all-wheel drive system, which should easily make it the baddest Gymkhana car we’ve seen yet. The car will be unveiled at the SEMA show in Vegas this week.